Bhutan is a tiny Buddhist country nestled between Nepal, India, and China. In an effort to preserve its unique culture and religious traditions, it has adopted a “high value-low volume” philosophy toward tourism. But since tourism is a crucial source of income, Bhutan is expanding its tourist infrastructure as quickly as it can. 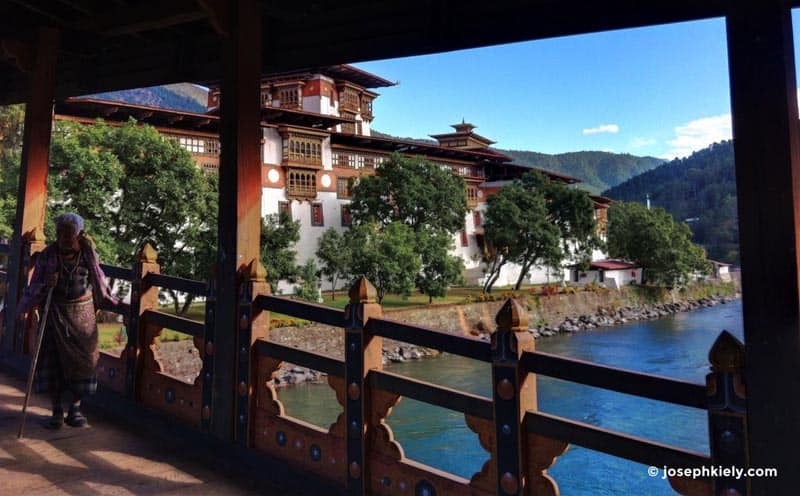 I've rounded up my best cultural experiences in Bhutan. Only 200 tourists entered Bhutan in 1974, but now over 100,000 have visited. I urge you to visit before the country changes too much. 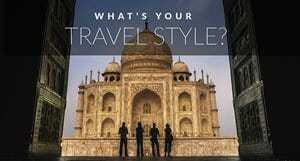 If you’re not an Indian national, you must travel with a government authorized travel agency and pay the daily stipend of $250.00 per person, 1/3 of which goes directly to the government. When it opened its borders to tourism in 2001, Bhutan also let TV and Internet access into the country. 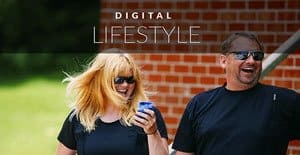 Bhutanese youth quickly adopted this new media, and you will now find them in the capital city of Thimphu on cell phones and sporting western style clothes. In 2008, the country became a two-party democratic government but still maintains its state sponsored religion. Bhutan is well known for its philosophy of “Gross National Happiness.” The goal of which is to preserve the peace and happiness along with the security and sovereignty of the nation. Also see: How Hard is it to Climb Mount Kilimanjaro? Bhutan is broken into three regions: west, central, and east. The western side of Bhutan is the most traveled and developed with the international airport in Paro and the capital city of Thimphu. 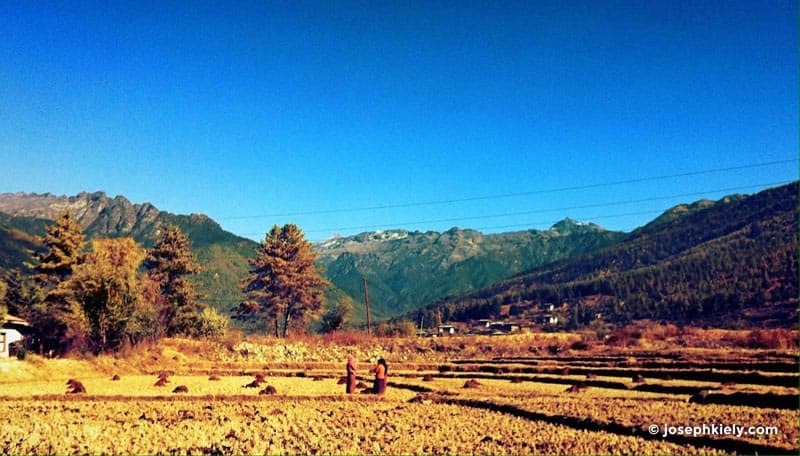 The high plains of central Bhutan are home to the spiritually significant Bumthang valley, which houses cliff side temples and sweeping fields of wheat, barley, and potatoes. Eastern Bhutan is a mountainous region where towns cling to the hillsides and roads are carved out of cliff edges along raging rivers. 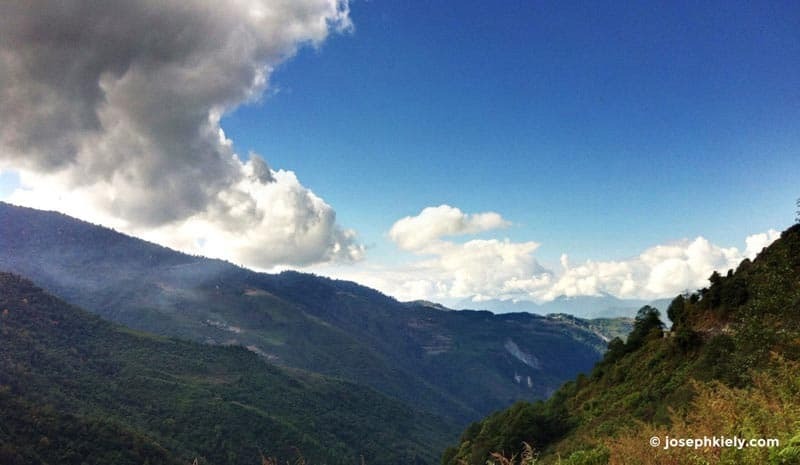 These five adventures are a good starting point for any trip to Bhutan. They offer a unique perspective on the people, culture, and landscape of the country. It’s built into a series of caves that, when viewed from afar, looks like a man’s face. Specifically, the Guru Rimpoche’s face, an early Buddhist who journeyed from Tibet and meditated at the caves in the 8th century. The monastery’s perched high on the mountainside, and you can hike or take a horse part of the way up. Where is Tiger's Nest Monastery? It is located just outside Paro, and is usually visited after adjusting to the high altitude of 2133 meters (7,000 feet). The first views of the monasteries are from a ledge overlooking a ravine and river, which is also the last leg of hike. To reach the monastery you take a series of stairs down the cliff side across the falls and back up to the monastery. Photography and bags are not allowed into the monastery, but the views are indeed spectacular, and the wafting smell of butter candles and murmuring of monks transports you to another world. A Dzong is part fortress, monastery, and government office. Dzongs are the focal point of each regional city built for defense. These impressive buildings straddle rivers in the west and cling to mountain tops in the East. 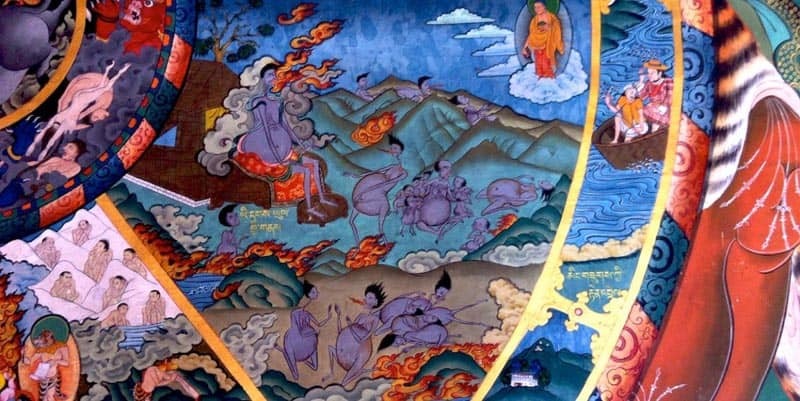 The interiors are elaborately painted with religious and inspirational imagery like the wheel of life – a symbol that illustrates the four truths of Buddhism and path to liberation. Since religion is state sponsored, the Dzongs are kept in pristine condition and are also the center of government affairs. On my visit, the Queen mother was visiting the Paro Dzong to give offerings. It was also a full moon day, which is holy to Buddhists since they believe Buddha was born and enlightened on the full moon. Since I was traveling in November (the end of the tourist and festal season), the Dzong’s were mostly deserted and I used the silence to reflect. In the Western part of the country, the Dzongs sit along rivers and overlook fertile valleys—usually with watchtowers perched on the ridges like the Paro Dzong. As you move East, Bhutan becomes increasingly mountainous and the Dzongs are built on defendable outcroppings that provide good views of surrounding mountains like the Trongasa (pictured above) and Lhuentsi Dzongs. Festivals make for the ultimate cultural experience in Bhutan. The season is rich with color, dance, and iconic animal masks. Festivals are called “Tshechu,” meaning “tenth day” of the lunar month. The annual festivals are held across the country at various temples and Dzongs. The locals dress up in their finest clothes, and the festival dancers swirl, spin tales, and give blessings. In the larger towns, monks do most of the performing, but in the small villages the local men will assist. The two most attended festivals are Paro Tshechu and Thimphu Tshechu. For a less crowded experience, it’s worth the hike through mountain roads deeper into Bhutan to the more remote villages. There are dozens of festivals, from the “naked” festival in Mongar to the “coming of the black necked cranes” festival in the Phobjikha Valley. Witnessing the daily lives of Bhutanese farmers and staying the night on a farm is a special experience. You will have the opportunity to take the traditional stone bath, assist in preparing food, and sleep under the rafters of an ancient farmhouse. Chillies, butter, and cheese are cooked down into a mixture that serves as the main side and condiment in Bhutanese food. It is paired with a variety of dishes. We also made a chili and beef stir fry, turnips, potatoes, and heaps of rice. We washed it down with the salty, fatty butter tea. Bhutan’s remote location and dramatic landscape makes it perfect for the adventure seeker. Head off the beaten path and you can reach the remote villages and fascinating cliffside monasteries on short day hikes or longer treks. There are many treks to take in the Bumthang Valley. I went up to the Luk Rawa temple through the small farming village of Lusbe. The temple is stuck to the side of a cliff, and is where the now infamous Guru Rimpoche had once meditated and left his footprint in the stone face. As Bhutan is at the base of the Himalayas, you can also try rafting. The rivers surge down the Himalaya, carving deep ravines and weaving through the mountain landscape into the plains of India. On my journey across Bhutan I took the less eventful rafting excursion down the Mo Chhu river. I floated passed the rolling mountainside and fields and saw a variety of fish and fowl in the bright high altitude sun. End the rafting excursion as you pass directly under the bridge that leads to the Punakha Dzong, which sits at the joining of the Mo (mother) and Pho (father) Chhu river. More extensive treks and hikes can be planned out carefully in advance with your guide. 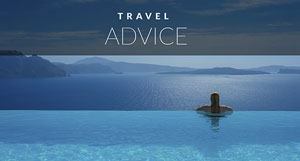 Depending on the season, your travel scenery will change dramatically. In the spring you’ll find bright flowering hillsides and periodic showers with some cloud cover. Fall is the dry season, and you will have clear skies and views of the Himalayas—it’s also the height of festival season. If your looking for more adventures in the Himalayas check out the article on Mountain Biking in Pokhara, Nepal. 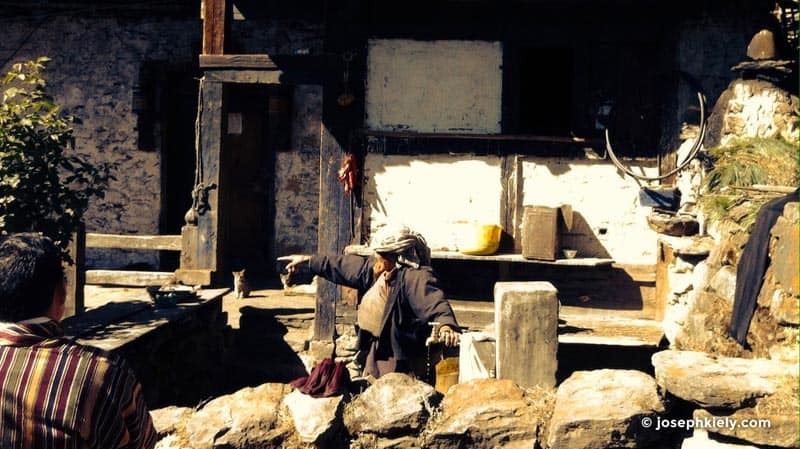 If you do not have the time to travel across the entire country, spending just four or five days in the Paro Valley viewing festivals and hiking to the Tiger’s Nest will give you a peek into this fascinating, and once isolated, country. 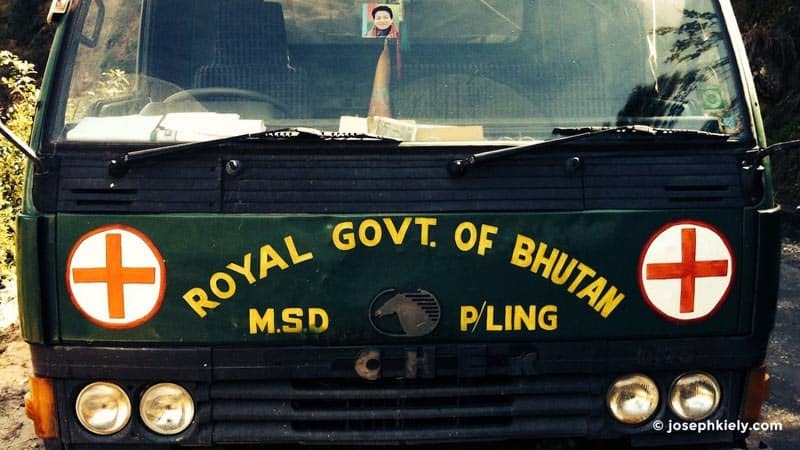 Bhutan is a country in transition and you should be prepared. It is balancing western influences while still holding onto its core tradition and religious beliefs. As I traveled across the length of the country I saw great change: the rough infrastructure was being dramatically improved with road widening, and there are new western style hotels and massive hydroelectric projects. So take the opportunity while you still have it and visit this special country before its new roads, and newly wired citizens adopt the lifestyle of the western world. I was born with wanderlust. It comes first from my Parisian mother, who moved from Europe to find love in Los Angeles, California. The doors to travel opened to me on my parents’ 25th wedding anniversary, when they travelled back to Paris and brought me along. 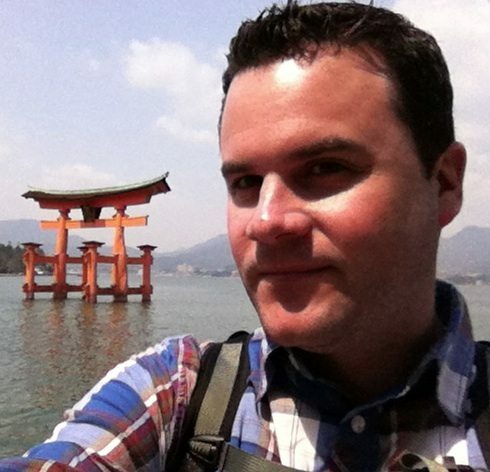 I caught the travel bug and was soon backpacking all over the world—from Western Europe to the remote Tibetan plateau. I now love to share my journeys through my blog and inspire others to escape through travel and culture. 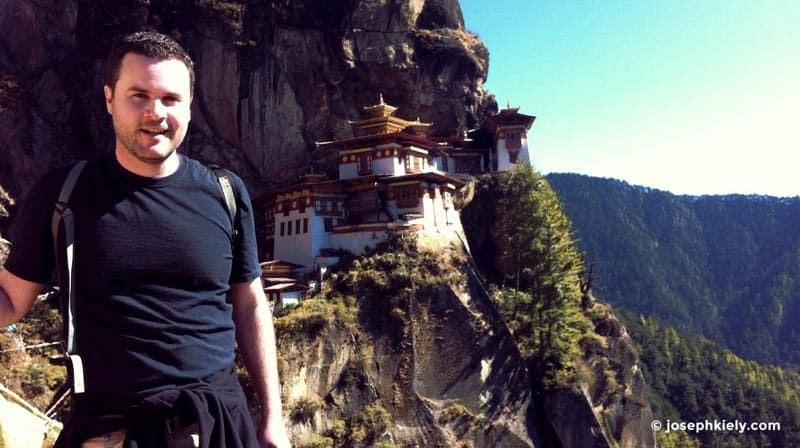 29 Responses to "Top 6 Cultural Experiences in Bhutan"
I have always wanted to go to Bhutan and this article has made me certain about it. Really good insights on what to explore for the Bhutanese experience. 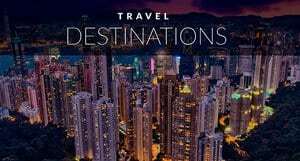 Appreciate it for your great effort to share your travel experience in this blog. It looks so amazing. Maybe once I have competed all the routes in Nepal I will then go Bhutan. The Tiger’s Nest Monastery looks awesome. I really enjoyed your article and was wondering if I could also get your permission to reproduce your article on my travel website for Bhutan. Of course all due credit will be given to you. Please let me know if that is ok with you. Bhutan is number one on my bucket list.What an amazing and inspiring place. . . “Gross National Happiness” – what an ideal world. I like that idea too. But I would like to see it for myself to see if they really are that happy or if it is just a skewed government ploy. I never trust things until I see it with my own eyes. I guess that’s why I love travel so much. It shatters preconceived notions and myths that I already have set in my mind. Hmm..I agree with you that Bhutan is full of blessed nature and beauty too. I heard a lot of good things and And famous places to visit. 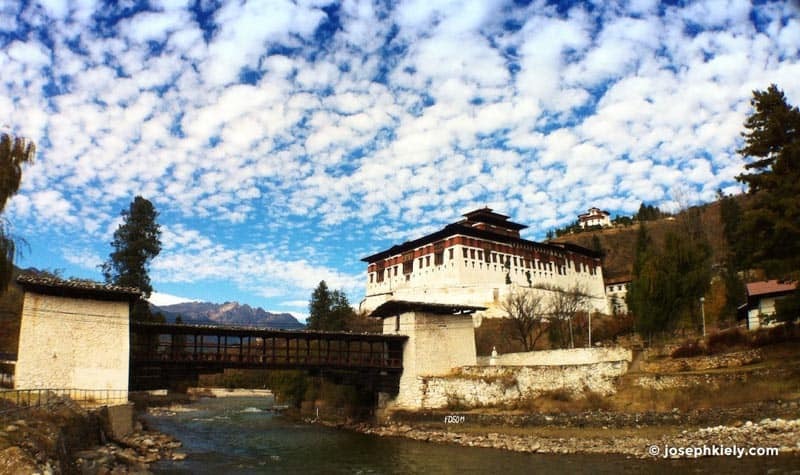 Through your blog I get to know a lot of information here and I think when I got time for vacations I’ll choose Bhutan first to visit..
Looks like a fascinating place to visit. Hopefully the increase in tourism won’t change it too much. I just returned for Bhutan and have to say it is one of the most inspiring places I have ever been. In fact, I am thinking of going back in August. It seems an interesting country to visit! I will add the place on my bucket list of must go places before this year ends. I am curious what month is the best time to go there? wow, didnt know much about bhutan but this is extraordinary! love place with a lot of history and culture, truly remarkable place, and i would love to visit the ‘tiger’s nest’! by the way how was that chilli cheese? 😀 it looked delectable! Great article, Lovely photography! Cheers! THANK you… the chili cheese is actually DELICIOUS… especially when you have been eating mostly rice. It’s a spicy, cheesy and delectable side – makes everything tasty! Not only is the place remarkable but the people are beautiful, friendly and curious. I so recommend visiting. Bhutan is on top of my wish-list this year! I am itching to go there. Thanks for this lovely article and pictures. Really inspiring! Same with us. 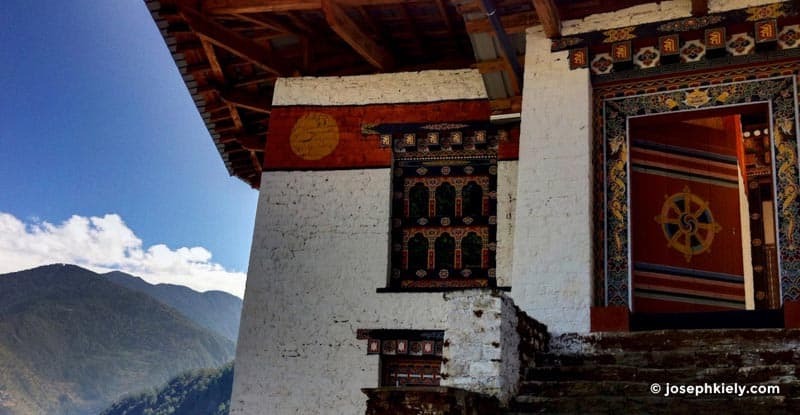 We were very excited for this post because Bhutan is a place we want ot travel to in the future ourselves! And Renuka, it’s not too far from you (relatively speaking with us being from Canada) I have a feeling you’ll get there before us. I’d definitely love to attend a festival in Bhutan. WE agree, not a lot of people have travelled to Bhutan or even know much about it. We’re thrilled to see this list as well. I have been thinking of doing Bhutan for quite a while now, this post will hopefully give me a nice kick to get in gear! Same with us. We wish we popped over when we were in Nepal. We’re just going to have to get ourselves back there. YOU SHOULD GO…!!!! – Visit my Bhutan page if you want some more info – or send me an email – I love to help – it has to be one of the best trips I have taken. – Joseph. When we go we’ll definitely be picking your brain!